And talking of Ilaiyaraja’s songs in this raga where he had composed most the hit melodies would be incomplete with the omission of “Poonkadhavey thaazh thiravaai” from Nizhalgal/1980/Deepan Chakravathy-Uma Ramanan. This comment seem to come from an inherent dislike than a discerning listener. No one disputed the genius of Ilaiya raja and it is also true that Rahman also has it in his genes. he has only taken music to the next stage keeping in mind the changing tastes thanks to MTV and globalization of music. If we keep Rahman at a distance from Ragas may be it should be for his songs in kandukonden kandukonden, or sangamam or even for strangulation of the raga Ahir bairav in vidukathaiya in Muthu!! I think Charulatha is doing the right thing and her effort is not to say who is best, but how creative are composers from GR to AR in interpreting the ragas. Since I am not talking of ragas but enjoying them would prefer to hear all music that has melody and rhythm. shame on this person for a comment like this ,why does every purist desist from even a single step of innovation or fusion in music ,its these traditional purists of a certain so called "elite" tamil caste section who restrict the growth of carnatic music ,keeping it bound within their own chains of conventions and reservations.A.R Rahman is a very innovative composer indeed who doesn't stick to purist class of music,he explores and experiments and its a gift for people like us to have grown up on his music. While “Poonkadhavey thaazh thiravaai” is an excellent song that uses notes from the Mayamalavagowla scale, many listeners familiar with Carnatic Music might relate it to the allied ragas Jaganmohani and Kamalamanohari owing to the sparing use of the "Ri" note. I am able to recognize a few older songs mentioned there. And wrt. above commenter - Please remember that there are people reading this blog who are not very familiar with the older songs. We are more familiar with A R Rehman's tunes and hence I hope it is fine to quote them. I noted your bitchy comment on the Anandabhairavi article also. You seem frustrated that you spend all this time collecting info on film songs and nobody is inviting you from Hindu newspaper to shower your pearls of wisdom. Get a life man!!! 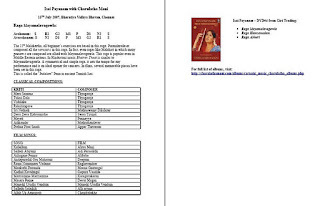 Can you please tell us for which occassions this Suddhasaveri raga can be used? Like Charukesi for Karunyam, Kalyana vasantham for Auspicious things..etc..
Suddha Saveri is used to express youthful enthusiasm and joy. Your Isai payanam is marvellous. As a lover of music, I could appreciate each raaga's beauty from your presentation.I pray my deity kanchi kamatchi to shower Her blessings on you and your family.Please continue to do this punya kariam. I have been buying stuff from iTunes and other sites for sometime and spending lot of money. I ran into your web site and landed into a treasure. What a content. God bless you for offering it us for free. I hope most of those out there are like you. May I have the notation for the above varnam? You have entered n2 both in the arohanam and avarohanam in the brief guide. I think Mayamalavagowla has n3(kakali nishadam). Kindly rectify. This worked as vivadi ragas were not covered then. The Raga's journey articles mention all the notes by name specifically to avoid any ambiguity. Thanks for pointing it out! The guide will be updated for consistency. 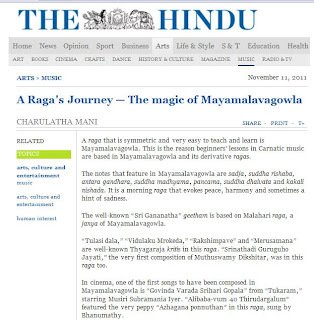 The details for this ragam, Mayamalavagowlam, is neither available in you tube nor here. Could you please upload the video since it is the beginning raga in carnatic music sarali varisai and onwards.